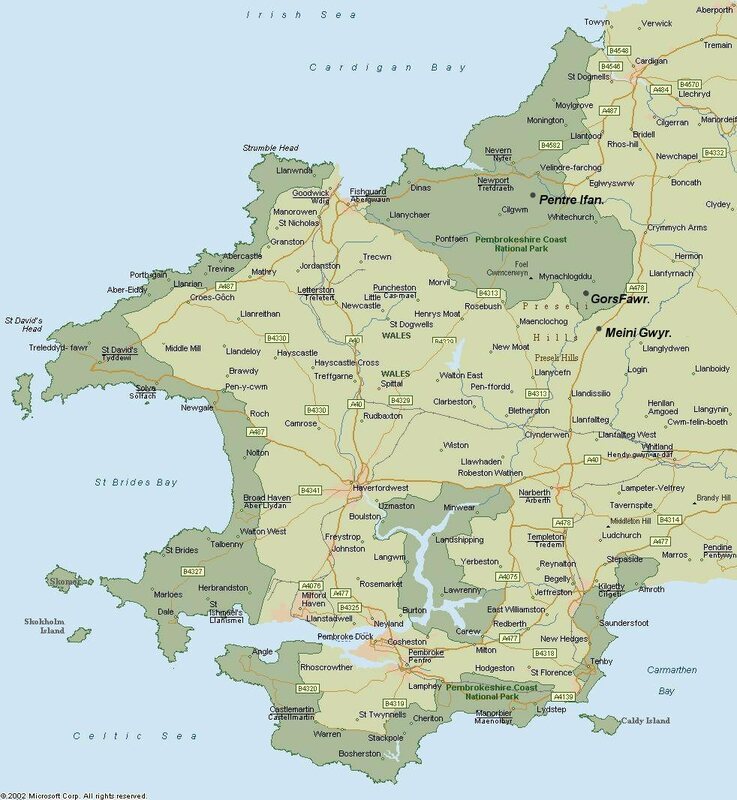 Location: Nr Nevern, Pembrokeshire, Wales. 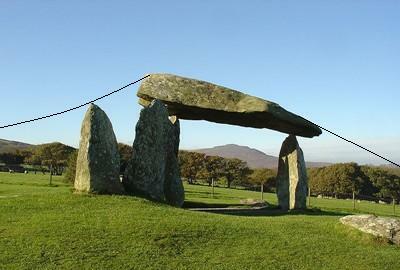 Grid Reference: 51° 59′ 56.4″ N, 4° 46′ 12″ W.
Pentre Ifan: (Passage Mound - Court Tomb). 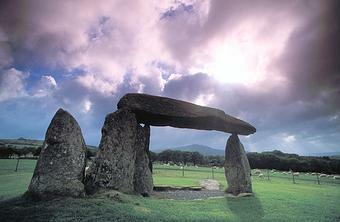 The largest and best preserved Neolithic dolmen in Wales. Although very little remains of the original structure, this is still an impressive site to see. 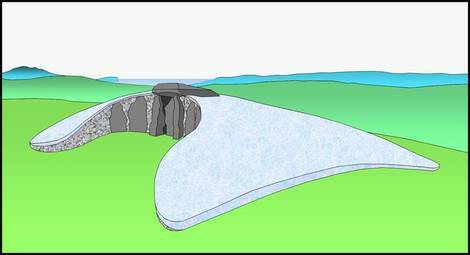 The estimated 16-ton capstone rests delicately on three tapered stones, its angle reflecting the slope of the Carn Ingli ridge visible on the western skyline. One of the most popular and visually rewarding megalithic sites in Wales, Pentre Ifan is a splendid dolmen with a huge capstone delicately poised on three uprights. 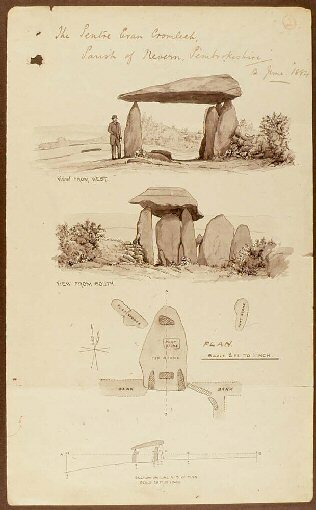 Once known as Arthurs' Quoit, 'Pentre Ifan' means 'Ivan's Village'. The capstone weighs over 16 tons; it is 5m (16ft 6in) long and 2.4m (8ft) off the ground. The stones of the chamber are all of local igneous rock; on the portal stone there is a faint decorative cup-mark. Excavations in 1936-7 and 1958-9 showed that the dolmen originally lay within a shallow oval pit, and that the trapezoidal mound of earth covering it was up to 36m (120ft) long. The semi-circular façade, as in the Irish passage mounds/court-tombs, was marked by two upright stones on either side of the south-facing portal. The forecourt was blocked with rows of tightly wedged stones; some of the original kerbstones around the barrow can still be seen. Within the cairn were a number of enigmatic features: a slumped stone, deliberately felled before the cairn was built, an irregular line of small stone-holes and a pit with signs of burning. Artistic Impression of the Original design. (The number of artefacts discovered was very small, and included no trace of burial). Extract: 'The Fairy Faith in Celtic countries' by W.Y. Evans Wentz, 1911. "The region, the little valley on whose side stands the Pentre Ifan cromlech, the finest in Britain, is believed to have been a favourite place with the ancient Drulds. And in the oak groves (Ty Canol Wood) that still exist there, tradition says there was once a flourishing school for neophytes, and that the cromlech instead of being a place for internments or sacrifices was in those days completely enclosed, forming like other cromlechs a darkened chamber in which novices when initiated were placed for a certain number of days....the interior (of Pentre Ifan) being called the womb or court of Ceridwen". It is likely that in its original completed form, the overall shape of the structure would have mirrored the outline of distant Carn Ingli. A sketch of the 'Cromlech' from 1884. (Click on the image for an enlarged view).